In an unusual (in a good way) turn of events, R was inspired to cook dinner this weekend. He watched a Giada DeLaurentiis Everyday Italian episode on the Food Network and decide to try his hand at ricotta, spinach and prosciutto ravioli; not an easy choice for a first meal! It was a huge treat and turned out great (albeit not without much stress and angst emanating from the kitchen). 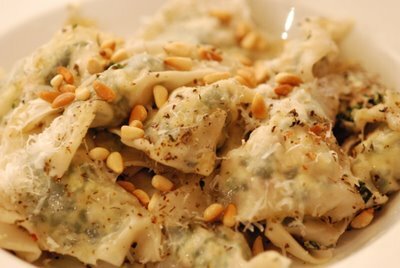 He even adapted the original recipe to substitute an olive oil sauce for an unhealthy butter sauce and added toasted pine nuts for extra flavor. Whisk the ricotta, spinach, prosciutto, egg yolks, salt, and pepper in a medium bowl to blend. Heat the olive oil in a heavy small skillet over medium heat. Add the oregano and stir 1 minute. Season, to taste, with salt and pepper. Remove from the heat. Working in batches, cook the ravioli in a large sauté pan of boiling salted water until just tender, stirring occasionally, about 4 minutes per batch. Transfer the ravioli to a large shallow bowl. In a small skillet, toast the pine nuts until golden brown and fragrant. 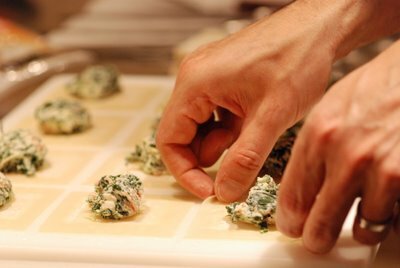 Pour the oregano olive oil over the ravioli and toss gently to coat. Sprinkle the pecorino and pine nuts over the ravioli and serve. “A” had a cookie swap last weekend. She invited a bunch of people over for soup and a chat and asked everyone to bring a batch of cookies. At the end of the get-together, everyone packed up an assortment of the cookies. A very cute idea! I'm not much of a cookie maker; I'm much more of a cake baker. I love a classic chocolate chip but I was sure someone else would cover that territory. 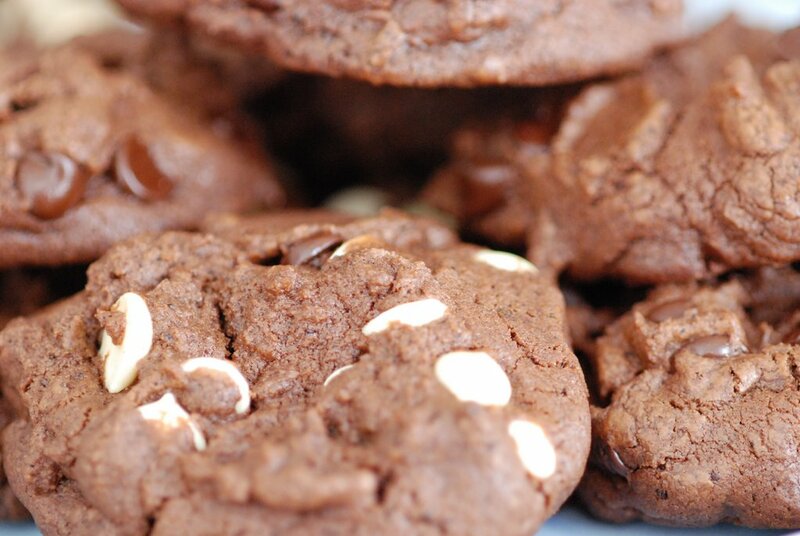 Instead, I revisited a few recipes I've used lately and combined them to create thick and chewy double chocolate espresso cookies using both white and semi-sweet chocolate chips. I checked Cooks Illustrated's The New Best Recipe because I was sure they'd have a reliable basic chocolate chip cookie recipe for thick and chewy cookies and then I decided to pump up the flavor by decreasing the flour and adding cocoa powder to make a chocolaty cookie and adding some espresso powder. I used white chocolate chips in half of the dough and semi-sweet chips in the other half to create some variety. The most interesting part of the Cook's Illustrated version was the way they suggested creating the dough balls. The result was a very irregular, large, thick, artisanal looking cookie which was just what I was after! Mix butter and sugars together until thoroughly blended. Beat in egg, yolk, and vanilla until combined. Add dry ingredients and beat at low speed until just combined. Stir in chips to taste. Roll 1/4 cup dough into ball. Holding dough ball in fingertips of both hands, pull into two equal halves. Rotate halves 90 degrees and, with jagged surfaces facing up, join halves together at their base, again forming a single ball, being careful not to smooth dough's uneven surface. Placed formed dough balls onto cookie sheet, leaving 2 1/2 inches between each ball. Bake, reversing positions of sheet halfway through (from top to bottom and front to back) until cookies start to harden at edges yet centers are still soft and puffy, 15 to 18 minutes. Cool cookies on sheets. When cooled, peel cookies from parchment. Ok - no more turkey or Thanksgiving fare until next year please (although it was great while it lasted). R, the doggie and I have had it with turkey for now. Instead of posting a recipe this week, I thought I'd turn it over to you: what was your favorite holiday recipe? Please do share – I’d love to hear from you! 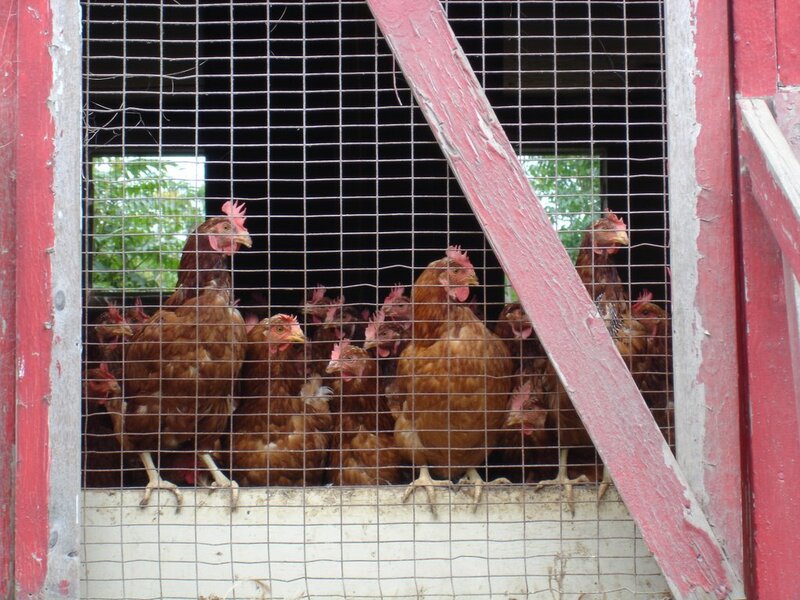 I'm hosting Thanksgiving this year. I've been getting organized for the big day: collecting recipes, shopping and slowly preparing dishes which can be made in advance. I'm making some things which look really interesting and which I know will be great, and others which I, well, hate but am making in the spirit of Thanksgiving. Firmly in the hate camp is cranberry sauce. I hate the gelatinous sugary mush that does a complete disservice to the interesting, very American berry. I decided to be a good sport and make a couple varieties. 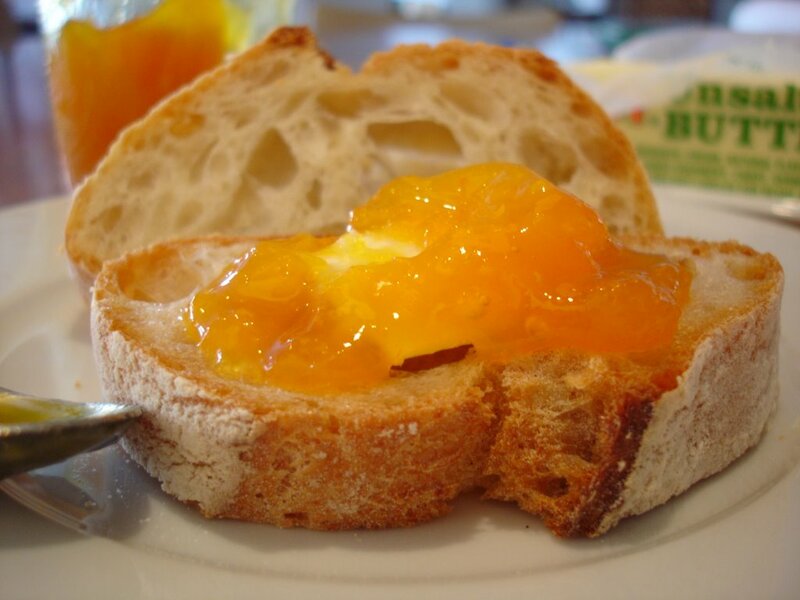 The first one was made last night: a cranberry marmalade with diced orange (skin, pith and all). It turned out gelatinous and too sweet. If I were to make it again I'd halve the sugar. But someone's bound to like it so I'll stay the course. The next one I made tonight. 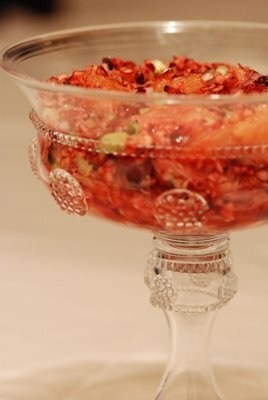 It's a cranberry-orange relish that caught my eye because of the untraditional ingredients and preparation. Interestingly it's no-cook and includes jalapeno pepper which gives it an unexpected kick. The original recipe called for a finish of mint leaves and pecans but it is wonderfully interesting and uncomplicated without so I skipped that portion of the recipe. I also halved the sugar having learned my lesson. The result was fantastic – a true service to the cranberry and break from the dreaded jiggling jelly. I even think this one can get away with being served on another day of the year! Recipe adapted from Martha Stewart, 1995, go figure! Place cranberries in food processor, and pulse to chop coarsely, about five pulses. Transfer to a medium bowl. Add onion, jalapeño, lime juice, orange sections and juice, ginger, sugar, and celery; mix gently. Refrigerate for at least 1 hour and up to 2 days. No recipe this week -- and this is why -- a new puppy! 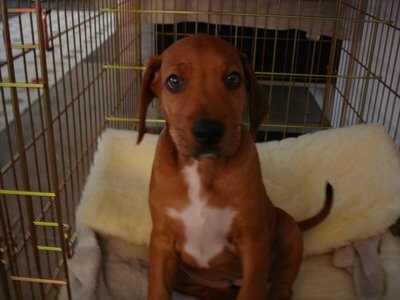 She's adorable and running us ragged. So take the opportunity to peruse the archives this week and try out some things. Please also take the opportunity to post some comments (encouragement, feedback, love and kisses) – I feel like I’m writing into a void without them! ‘Til next week. . . This photo certainly does not do justice to this dish, which is my all-time favorite. I tried. I photoshopped. No dice. You'll have to use a little imagination. I'm not sure when it happened (or why) but linguine vongole became my favorite comfort food some time ago and I cannot resist ordering it whenever I see it on the menu. This means that I've been to many great Italian restaurants and have deprived myself of venturing further than this dish. I simply must have it. 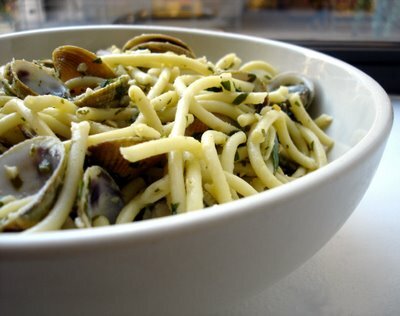 I love the garlicky flavor and the sweet little clams. I love digging out the little clams and the satisfying clank of the shells on the plate as the remnants pile up. I've tried it at home to satisfy a craving a number of times and Martha's recipe hits the spot best. It's quick and easy. The only time consuming part is scrubbing the cockles to remove sand and grime. I made it last week and we slurped it up with a crusty whole wheat baguette. Then we ate left-overs standing in the kitchen the next day and it was just as good (if not better)! Bring a large pot of water to a boil. Add salt and pasta, and cook according to package instructions until al dente. Drain, reserving 1/2 cup cooking water. Heat olive oil in a large skillet over medium heat. Add garlic and red pepper flakes, and cook, stirring, for 30 seconds; do not let garlic brown. Stir in parsley, zest, 1/8 teaspoon salt, and a pinch of black pepper; cook for 30 seconds. Add wine, and simmer for 1 minute. Add clams; increase heat to medium-high, and cook, covered, until clams begin to open, 3 to 4 minutes. Stir in butter until incorporated. Add pasta to skillet, and toss to coat, adding reserved cooking water a tablespoon at a time to loosen, if desired. Transfer to a large serving bowl, and serve. My aunt always buys a terrific spinach couscous salad from a deli on the upper east side that we all love and devour. Time to figure out how to make it at home! 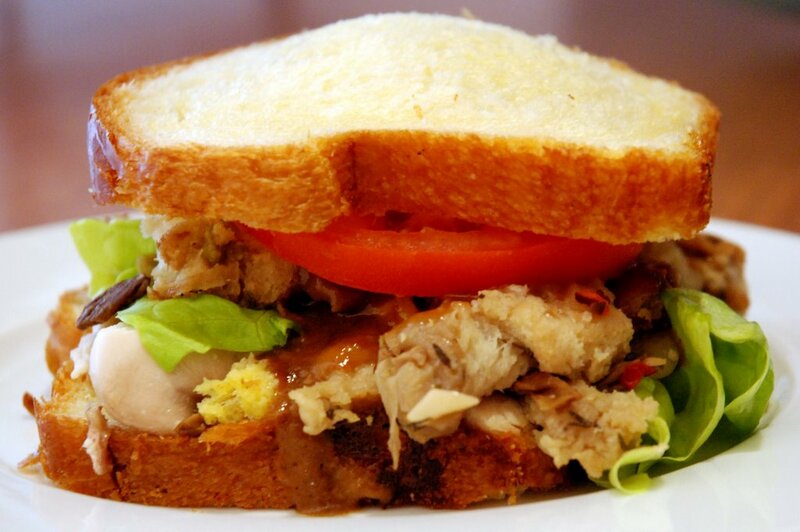 It's extremely simple to make and is the perfect summer lunch. I tried a few times to successfully reverse-engineer it and I think I've got it! Allow couscous to cool. Chiffonade spinach and combine all ingredients. 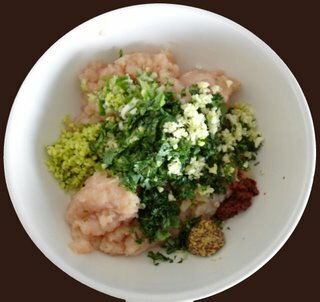 This version, which we like, is more spinach than couscous but adjust quantities to your liking. I like to drizzle a little olive oil and sprinkle some additional salt on mine before I eat it but it's also good just as it is. My friend Alison, who has a treasure trove of great recipes, sent me her favorite muffin recipe which I tried this weekend and loved. It's so easy and can be reasonably healthy if you swap the oil for applesauce. 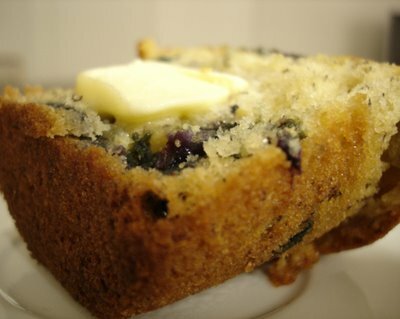 She loves raspberry chocolate chip, but R and I picked fresh blueberries recently and I decided to use them in these muffins -- delicious! (note: I added a pinch of cinnamon to the batter and brushed the tops lightly with cold water and dusted with granulated sugar for a pretty finish). With blueberries in season, this is a tasty recipe for brunch or just week day mobile breakfast. Strawberries seemed like a good idea but result was too soggy. My favorite combination is raspberry chocolate chip. Though the batter includes bananas, the flavor is subtle. Mix together ½ cup plain or vanilla yogurt, ½ cup oil, 1 cup sugar. Add 1 cup mashed bananas (about 2 ripe bananas, mash by hand), 2 eggs, 1 tsp vanilla. Mix until fairly smooth. 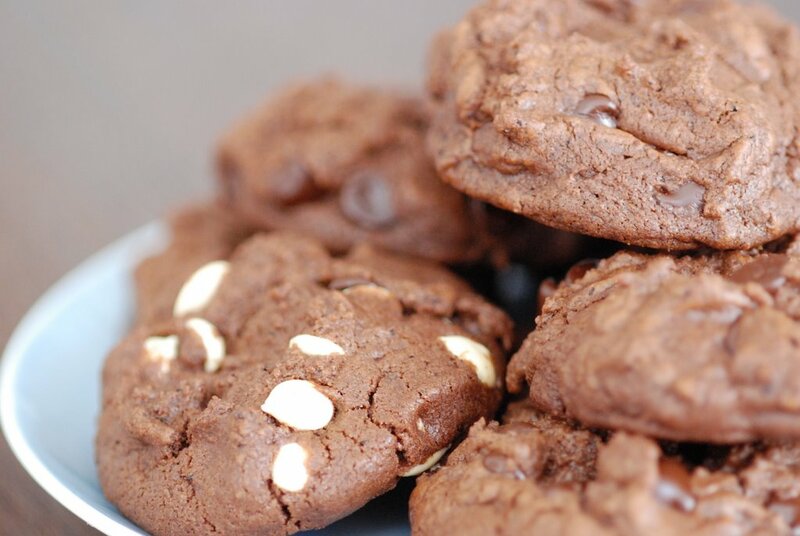 In a separate bowl, mix 2 cups flour, 1 tsp baking soda and ½ tsp salt. Add dry to wet, mix until incorporated. Then add 1 heaping cup fruit, nuts or chocolate chips. Pour batter into muffin tins (I use Texas-size pan to make six large muffins but you can make 12 regular size muffins) and bake 40-45 minutes, until top is golden brown. Note: Can make muffins with blueberries (fresh work better than frozen), chopped pecans, chopped walnuts, raisins (dark and light), and chocolate chips. Topping of cinnamon sugar is nice too, can swirl cinnamon sugar in the middle of the muffin as well. When adding raisins or nuts can add ½ tsp cinnamon to the dry ingredients. To make a non fat version, substitute ½ cup applesauce instead of the oil. I have tagged several classic French recipes in my Bouchon cookbook that I want to try. One of them is Beef Bourguignon, which looks so complicated and time-consuming that I've delayed tackling it for the past six months. Now that it’s August, I have an excuse to prolong the delay since it’s not exactly hearty stew weather. 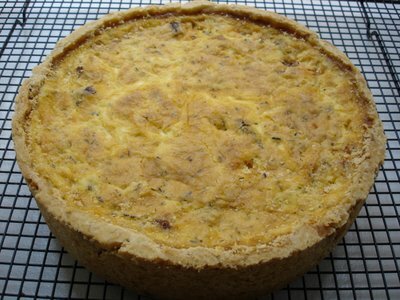 Another of the recipes is for a classic French quiche. Well quiche isn’t too hard, right? That's what I thought as I pulled ingredients together for quiche. I started making it in the early afternoon thinking that, served with a great green salad, it would make the perfect light summer dinner. I did not bother to read the entire recipe carefully before I started. I mean, it’s quiche -- how hard can it be? Wrong! This was the most time-consuming and scientifically precise recipe for quiche that I have ever seen. The process involved many steps of forming, blind-baking and cooling the shell, cooking, rendering and whipping the various fillings, and slow-cooking the quiche to create a creamy texture. Phew! Suffice it to say, dinner ended up being 24 hours later due to all of the steps involved, but boy was it worth it! The result was a true French quiche with a creamy texture and full flavor. I made Quiche Lorraine which was sumptuous given the slab bacon, comté cheese and “onion confit” (onions cooked for several hours with butter and a bouquet garni of thyme, parsley, bay leaves and black peppercorns). I’ll post the recipe for a basic quiche since it’s considerably shorter. If you’d like the specifics for the Quiche Lorraine, feel free to post a comment and I’ll pass on the (substantial) information. 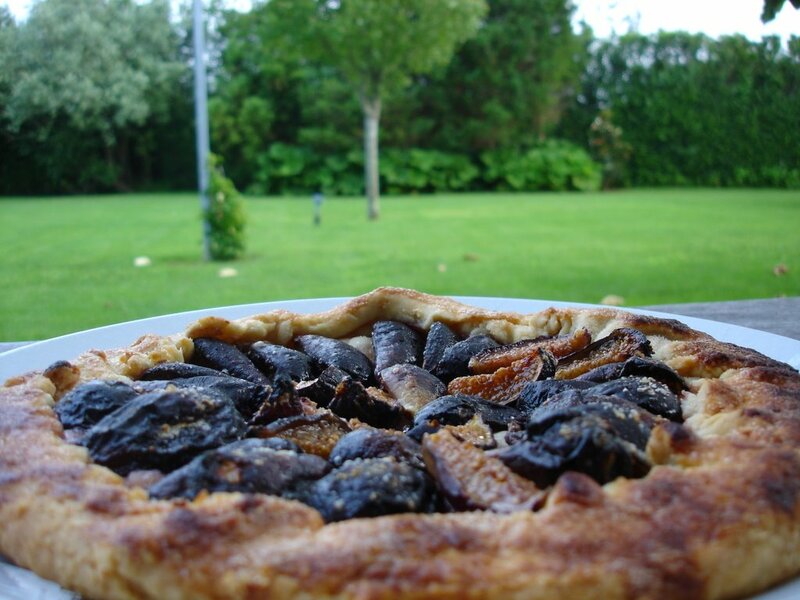 Use the basic chilled pâte brisée recipe from the rustic fig tart post (doubled in quantity). Roll the dough into a circle 14 inches in diameter and 3/16 inch thick. Re-chill the dough if it has become soft after rolling out. Lightly brush the inside of a 9-inch wide by 2-inch high ring mold with canola oil and place it onto a parchment-lined baking sheet. Carefully lift the dough into the ring (you can fold the dough over twice and then unfold it on top of the ring or use a rolling pin to roll-up, lift and then unroll onto the ring), center it on the ring and then lower the dough into the ring, pressing it gently against the sides and into the bottom corners of the ring. Trim any dough that extends more than an inch over the sides of the mold and reserve the scraps. Fold the excess dough over against the outside of the ring (to prevent it from shrinking down the sides as it bakes – the excess dough will be removed after the quiche is baked). Carefully check for any cracks or holes in the dough, and patch with the reserved dough as necessary. Place in the refrigerator or freezer for at least 20 minutes to resolidify the butter. Reserve the remaining dough scraps. Put a rack set in the middle of the oven and preheat the oven to 375. Line the quiche shell with a 16-inch round of parchment. Fill the shell with pie weights or dried beans, gently guiding the weights into the corners of the shell and filling the shell completely. Bake the shell for 35 to 45 minutes or until the edges of the dough are lightly browned but the bottom is still light in color. Carefully remove the parchment and weights. Check the dough for any new cracks for holes and patch with the thin pieces of reserved dough if necessary. Return the shell to the oven for another 15 to 20 minutes, or until the bottom is a rich golden brown. Remove from the oven and allow the shell to cool completely on the baking sheet. Once again, check the dough for any cracks or holes or and patch if necessary before filling the quiche batter. Turn the oven down to 325 degrees. Combine the milk and cream in a large saucepan and heat over medium heat until scalded (meaning a skin begins to form on the surface). Remove from the heat and let cool for 15 minutes before continuing. Put 3 eggs, half the milk and cream mixture, 1 ½ teaspoons salt, 1/8 teaspoon white pepper, and 3 gratings of nutmeg in a blender and blend on low speed for a few seconds to combine the ingredients. Increase the speed to high and blend for 30 seconds to a minute, or until the batter is light and foamy. This is the first layer of the quiche: once you have assembled it, add the remaining ingredients to the blender and repeat the process to complete the quiche. There may be a little excess batter depending on how much air is incorporated into the batter as it is blended. The quiche may sink slightly as it bakes. So check it after about 20 minutes and if there is room, add a bit more of the batter to the top. Bake at 325 for approximately 1 ½ to 1 ¾ hours, or until the top of the quiche is browned and the custard is set when the pan is jiggled. The custard should jiggle uniformly throughout vs. jiggle more quickly in the center. Be aware that the quiche will continue to cook once out of the oven, and do not overcook. The quiche needs to be thoroughly chilled before it’s cut, so make your quiche at least a day and up to three days before serving it. Trim any excess crust that extends above the custard using a serrated knife. Cut individual slices using a serrated knife for the side crust and a slicing knife through the custard and bottom crust and reheat in a 375 degree oven (for 15 minutes or until hot throughout) on a parchment-lined baking sheet before serving. As promised, this is the continuation of last week's Indian food dinner post -- this time with the recipes for the side dishes, stewed chickpeas and "beer rice." Bon appétit and please do let me know how it goes! 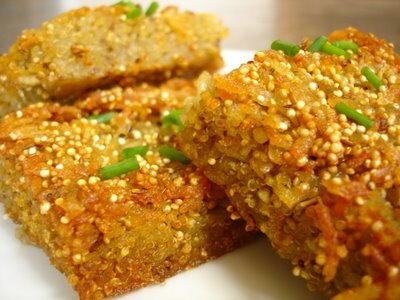 Heat oil in pan, add the cumin and coriander seeds and the asafoetida. Wait a few seconds until the cumin seeds "crackle", then add the onion. Sauté until the onion is brown. Add the turmeric and ginger, then all the remaining spices. Add the chickpeas and water. Bring to boil and add tamarind paste (stir it in to dissolve). Cook 30-40 minutes until tender. Add salt to taste. Garnish with cilantro. Note: Adjust seasonings to your taste -- the seasonings above will result in a mild version. 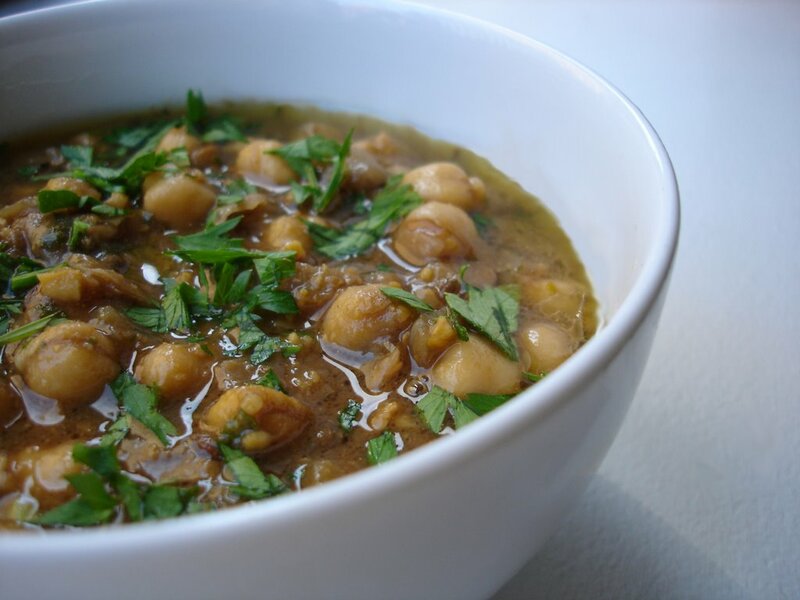 To thicken the sauce (if desired), crush some chickpeas with a woooden spoon against the side of your pot toward the end of the cooking time and continue to cook to thicken. Heat the oil and add the cumin seeds - wait for them to "crackle". 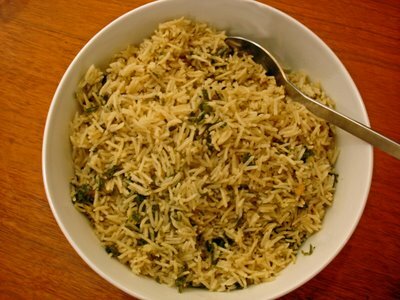 Add the rice and lightly move the grains around to coat them with oil. Wait until they become chalky. Mix the cilantro in with the rice. Add the beer and enough water for there to be 4 cups of liquid in the pot (should be about ~2 1/2 cups of water in addition to the beer). Add salt to taste. Bring the liquid to a boil, lower the heat, cover the pot and let the rice cook for ~15 minutes. Turn off the heat and let it sit covered for an additional 5-7 minutes. We had a HUGE treat last week. Friends of ours called to ask if we wanted to cook an impromptu meal together on Saturday night. I suggested we cook Indian food as they are experts on the subject and I appreciate Indian food but know nothing about cooking it. In no time at all my friend D, an enthusiastic cook, came up with a multi-course menu and we divided up a shopping list. We then met back at home where his wife and I dutifully followed all cutting, chopping and blending orders while he whipped around the kitchen turning our choppings into sumptuous fare. It was such a luxury to be treated to a home cooked meal (in our own home!) and to have no more responsibility than to mindlessly chop away while someone else worried about assembling the dishes. We had a wonderful meal of cold cucumber soup, beef curry, mustard shrimp and chickpeas served with Basmati rice infused with cilantro, and of all things, beer. The leftovers were even more magnificent the next day. I'm breaking this post into two to keep you in suspense -- check back next week for the chickpeas and rice. Blend all ingredients together. Adjust the consistency of the soup by adding water as desired. Add olive oil. 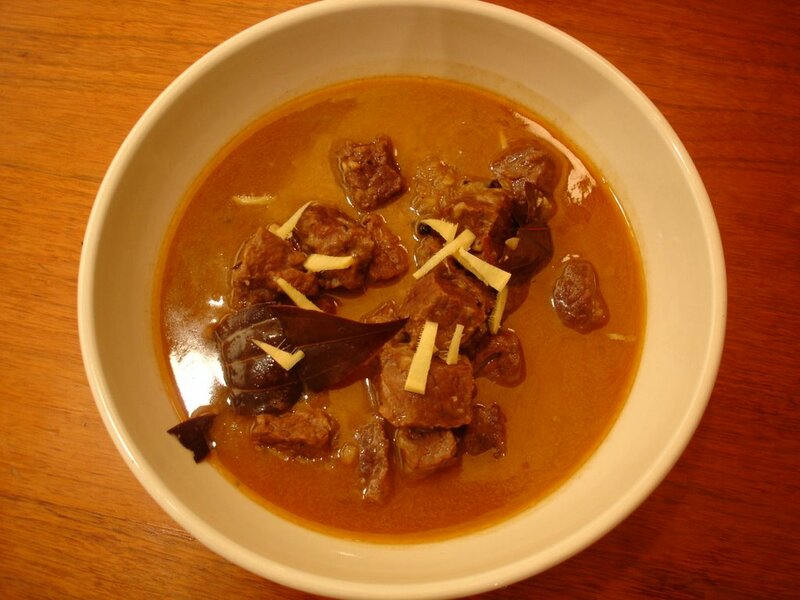 Chill in refrigerator and before serving garnish with roasted cumin and a sprig of coriander leaves (optional). Sauté the onion, garlic, ginger until golden brown and the oil separates. Add the beef cubes and brown. Add the spices and 1/2 the coconut milk and enough water or beef stock to cover the meat. 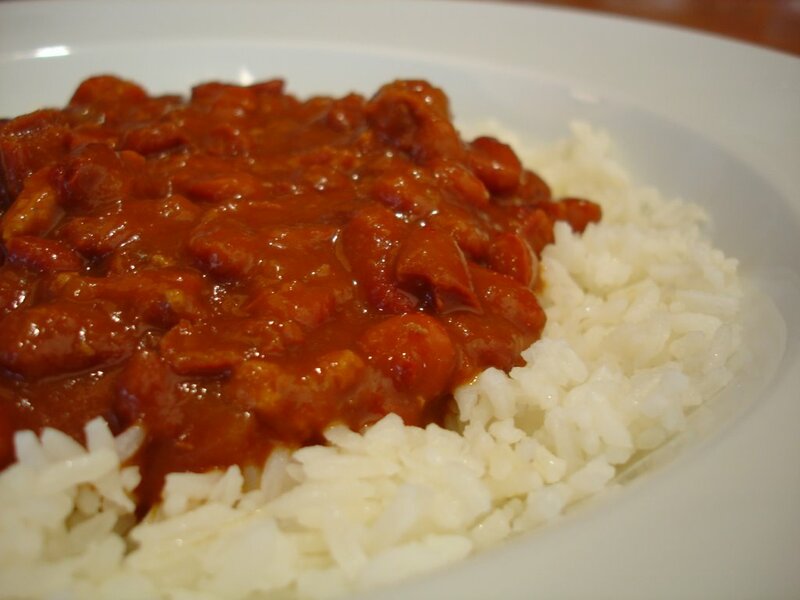 If you have a pressure cooker, bring to pressure and cook for 1-1.5 hours. If not, braise on low heat for 3-4 hours until meat is tender. Add the remaining coconut milk and salt to taste. Variation: replace cumin and bay leaves with black mustard seeds and curry leaves. Fry the mustard seeds in a teaspoon of oil before adding to the pan. I am a Manhattan-based photographer specializing in two of the best things in life: food and children. I love the challenge and diversity of both subjects, but I most enjoy the pleasure my images -- whether mouth-watering shots of delicious dishes or tender portraits of newborn babies -- bring to my clients. I love the creative process of turning a concept into a reality. I typically do my own food and prop styling and love every part of a shoot, from talking to the client about their needs, to developing a vision for the shoot. I love finding the perfect props to support the vision, shopping for the best ingredients, and cooking, styling and shooting a dish in a way that best communicates the vision. My work can be seen regularly in The New York Times Dining Section, numerous cookbooks, magazines and in the marketing materials of many private clients. For more information about my food photography, please see www.sabrakrock.com. For additional information about kids photography, please see www.sabrakrockkids.com. 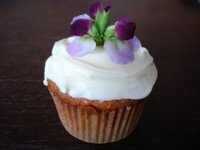 I've been taking a pastry class at the Institute of Culinary Education which has inspired a lot of weekend pastry making. Pastry is the one major hole in my dessert repertoire; I can do cookies, cakes and cupcakes without issue but I've never mastered the art of pastry making so this is my chance. During the first session we learned two basic doughs which offer endless possibilities: pâte brisée, (a flaky dough), and pâte sucrée, a sweet and slightly dense pastry dough. The former is a little tricky for a few reasons: 1) it requires quick work to keep the dough from becoming warm, melting the butter and losing its eventual flakiness 2) it needs to be kneeded without overworking it lest it become tough and 3) it can’t be patched well and needs to be rolled out only once. There is so much gorgeous fruit in farmers markets now I was inspired to try a fig tart with beautiful fresh figs. I used my class dough recipe and some simple instructions for making a fig tart adapted from one of my favorite seasonal cookbooks. Combine flour, salt and baking powder in a medium mixing bowl and whisk to mix. Pour mixture onto a clean, smooth surface such as a stainless steel table. Cut butter into tablespoon-sized pieces and add to dry ingredients. Toss once or twice to coat pieces of butter. Use your hands to rub the butter into the dry ingredients by breaking it into tiny pieces, continuously pinching and squeezing it into the dry ingredients. Be careful to keep the mixture uniform by occasionally reaching down to the bottom of the mixture and mixing all the ingredients evenly together. Continue rubbing the butter into the dry ingredients until the pieces of butter are dime/nickel-sized. Create a well in the center of the dough, spoon 2 tablespoons of the water into the hole, and mix gently with your fingertips, gradually working the water into the dry ingredients. The mixture will crumbly in the beginning but should begin to come together into a ball. If the mixture still appears crumbly after working it, add the remaining water (plus more if needed after mixing together), 1 teaspoon at a time, until the dough holds together easily. (Note: too little water makes a flaky crust that will crack during rolling; too much water makes an elastic, bread-like crust that lacks flakiness. Do not over-work the dough or it will become tough.) When finished, you should have a ball of dough with small pieces of butter still visible in the mixture. Wrap dough in plastic wrap and press it into a 6 inch disk. Refrigerate until firm, or until you are ready to use it, at least 1 hour. Clean and dry work surface. Dust lightly with flour. Wipe rolling pin clean. Dust lightly with flour. Pound dough with rolling pin in two directions so it begins to spread out then roll dough into a ~9 inch disk by rolling in one direction (away from you), turning dough 90 degrees and rolling away from you again. Repeat process until you have a 1/8 inch think disc, dusting more flour under dough and on rolling pin if it sticks. Trace a ~9 inch circle in dough using the bottom of a tart pan as a guide. Quarter figs through the stem or, if large, cut them in sixths. Set aside in a bowl. Just before you are ready to assemble galettes, sprinkle figs with 6 tablespoons of sugar and toss gently to distribute. Transfer dough to a heavy baking sheet. Arrange figs attractively on dough, leaving a 1 ½ inch edge all the way around. Fold the edge over to create a border making sure there are no cracks in the dough or the fruit juices will seep out during baking. Patch, if necessary, with bits of trimmed dough lightly moistened with cold water. Brush border with a little egg wash (1 yolk lightly beaten with a pinch of salt), then sprinkle the border generously with sugar. Bake at 425 degrees until crust is golden and fruit is bubbly, 22 to 25 minutes. Transfer to a rack and cool slightly before serving. Okay, so this isn't really a recipe since it is so simple but let's call it an idea / inspiration for these hot summer days. 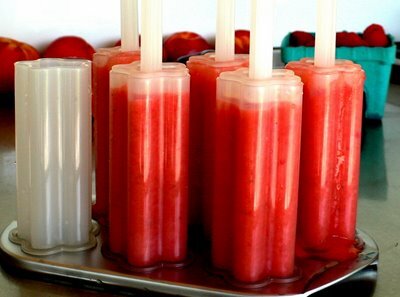 We had a 3-year-old over this weekend which motivated me to whip up some fruit pops (strawberry-lemon, raspberry-lime and banana). They are so easy I'm not going to write a formal recipe but rather list the ingredients and provide some guidance: fresh summer fruit (whatever your fancy), water, sugar (not too much), and maybe some citrus juice or something else (mint?) for additional flavor. 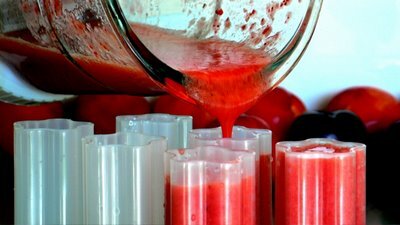 Combine in a blender, pour into molds and freeze for 3 hours to overnight. In terms of molds, Cuisipro has some of the cutest you've ever seen including these star pop-up molds which don't even require additional wooden popsicle sticks; they come with their own plastic sticks as part of the mold design which you can pop in the dish washer and use again and again. I tried these with uncooked macerated berries as well as tried bringing them to a boil with water and sugar first and then blending. The latter process seemed to work particularly well to bring out the flavors in raspberries. You can add yogurt to make a creamier pop (and swirl or stack flavors if you really want to go crazy) or keep it plain and simple. I could lie and tell you that our little guest devoured them but I think he was somewhat disappointed that he was not getting sugary ice cream and instead got disguised fruit. But we adults were very happy! Note: photos courtesy of the toddler's dad who has a nifty little digital camera! I happened upon a wonderful recipe for “Texas caviar” in Saveur this month. I had never heard of Texas caviar but a quick google search turned up a million variations on the same theme of spiced, black eyed peas. I’m always game for a good bean/pea salad, especially for one as beautiful as this one looks. 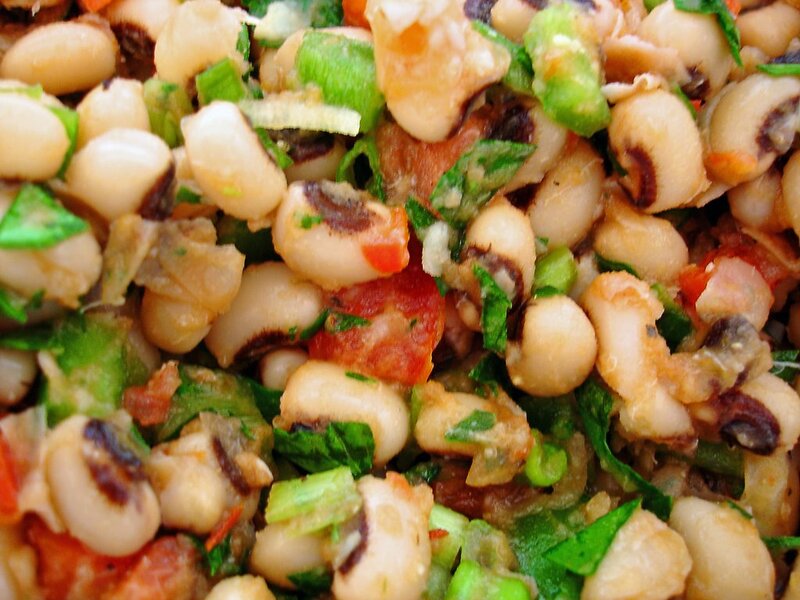 What’s more, I’ve been saving dried black eyed peas for Hoppin’ John on New Year’s for some time (without ever executing) so it was about time to make use of them. The original recipe called for a (16 oz) bottle of spicy Italian salad dressing but that seemed a little odd so I tweaked the recipe and we were all happy with the way it turned out. Cook dried peas (or drain canned peas). Black eyed peas cook fast and will quickly become mushy if you don't keep watch. Combine cooked peas with the rest of the ingredients, season with salt and pepper, and adjust other seasonings to taste. Cover with plastic wrap and refrigerate for 3 hours or overnight to allow beans to marinate and flavors to combine. Serve as a side salad (cold or at room temperature) or as a dip with chips. My mother-in-law visited this week from Texas to help us settle in. I asked her to bring her famous New Orleans spicy shrimp recipe (which she has been making for the past 30 years or so!) so I could add a southern recipe to my repertoire (I will share the recipe soon). We had the wonderful spicy shrimp on Saturday night with “Texas caviar” (to come in a later post). On Sunday, it was back to the barbeque with hot dogs accompanied by fresh corn salad made with local Long Island corn. 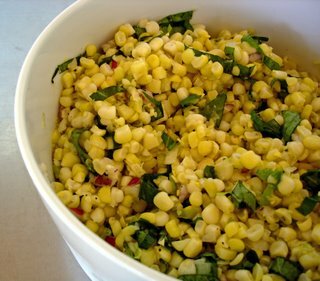 I’ve made this corn salad a gazillion times and love it every time. It is the essence of summer – sweet fresh corn and light flavors -- and is a welcome alternative to corn on the cob. The cider vinegar brings out the sweetness in the corn without overpowering it and the red onion and scallions give it just enough kick. The trick is not to over-cook the corn -- the kernels need only be cooked until they lose their starchiness (but still retain their crunch). Heat a large skillet over medium heat and add 3 tablespoons of olive oil. When oil is hot, add corn, salt, and pepper and cook for 5 minutes (or less) until just cooked and no longer starchy. Remove from heat and stir in red onion, scallion, cider vinegar and remaining 2 tablespoons olive oil. 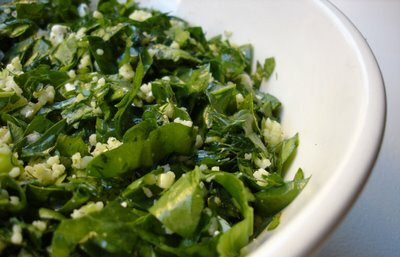 Allow salad to cool; stir in basil before serving. Serve cold or at room temperature. I’ve been slow to post this week because we moved. The kitchen (and everywhere else) needs some serious organizing – that will be the major project for the week. We rented a house by the beach for the month of July and spent our first weekend out there this weekend. Despite the fact that we had only been in our new apartment for a few days and had lots we wanted to do there, it was wonderful to take a break from boxes. On Sunday we had R’s sister and a friend out for a southern-style shrimp boil (more on this later – I’m still perfecting the recipe). The weather was perfect and we ate outside under the shade of umbrellas. On Monday, my sister and cousin came out and we barbecued and hung out by the pool. 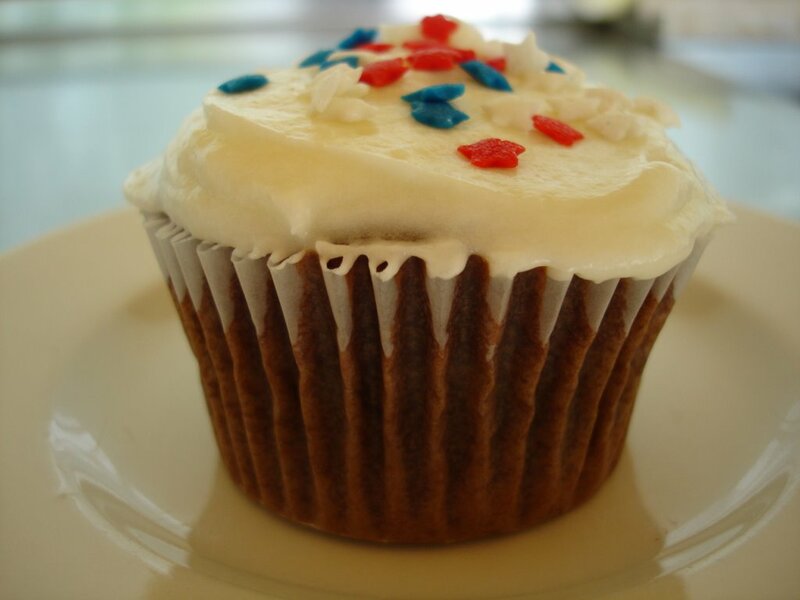 I made cupcakes to celebrate the Fourth of July decorating them with red, white and blue sugar stars that I found at NY Cake. I pulled the cupcake recipe from Elinor Klivan’s Cupcakes which I’ve found to have very reliable recipes and some good ideas. The chocolate sour cream cupcake is moist and scrumptious and is simple to make. 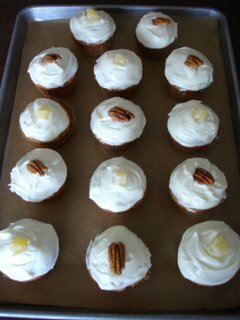 I went with a traditional buttercream frosting to keep things easy as we don’t have a lot of baking supplies or equipment in the summer house. Put the chocolate in a heatproof bowl or the top of a double boiler and place it over, but not touching, a saucepan of barely simmering water (or the bottom of the double boiler). Stir until the chocolate is melted and smooth. Remove from the water and set aside to cool slightly. Sift the flour, baking soda, baking powder, and salt into a medium bowl and set aside. In a large bowl, using an electric mixer on medium speed, beat the butter and sugar until smoothly blended and creamy, about 2 minutes. Stop the mixer and scrape the sides of the bowl as needed during mixing. On low speed, mix in the melted chocolate. 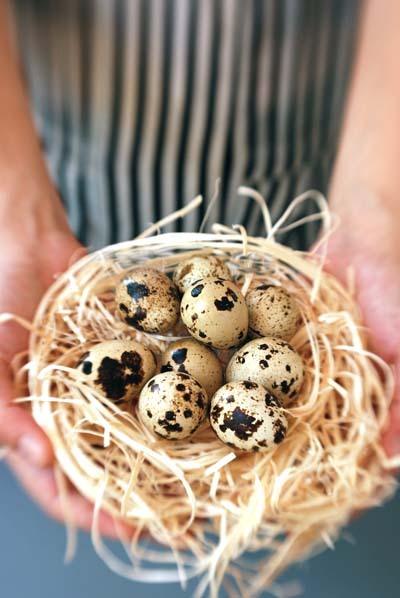 On medium speed, add the eggs one at a time, mixing until each is blended into the batter. Add the vanilla and beat until the mixture looks creamy and the color has lightened slightly, about 1 minute. Mix in the sour cream until no white streaks remain. On low speed, add half of the flour mixture mixing just to incorporate it. Mix in the water. Mix in the remaining flour mixture until it is incorporated and the batter looks smooth. The batter is ready to bake, or for additions such as nuts, fruit, chocolate chips, or other flavorings. Bake cupcakes at 350 for approximately 20 minutes. In a large bowl, using an electric mixer on low speed, beat the butter, powdered sugar, and vanilla together with 3 tablespoons milk, then add up to 1 tablespoon more milk if needed to form a creamy, smooth, spreadable frosting. 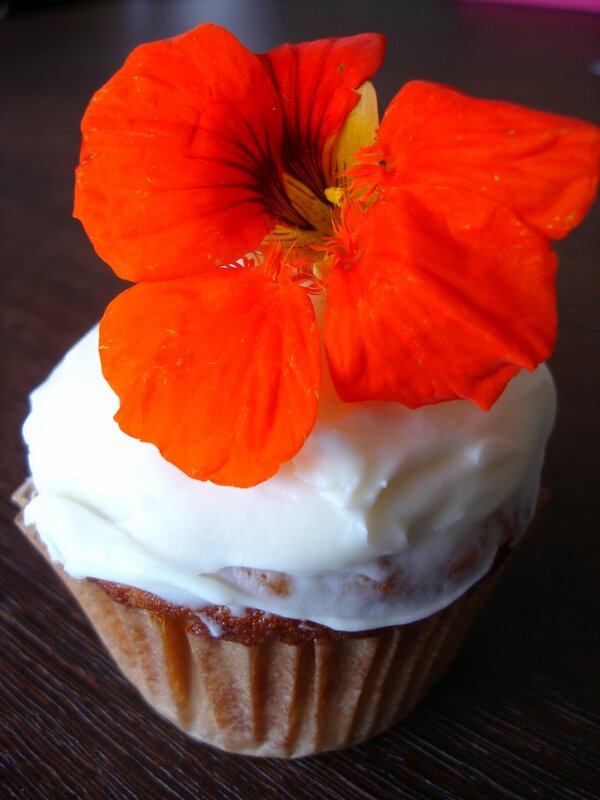 Use a small metal spatula to spread about 2 ½ tablespoons of frosting over the top of each cupcake. Decorate as desired. The cupcakes can be covered and stored at room temperature for up to 2 days. 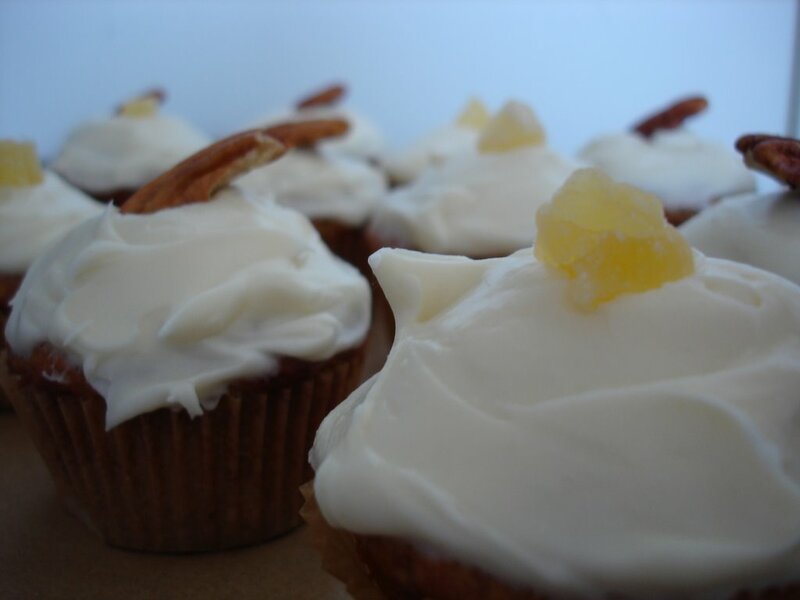 Optional: The frosting can be flavored with ½ teaspoon almond extract or 1 teaspoon grated lemon or orange zest. This is a really simple but impressive-looking and tasting dish. It calls for cockles too but I skipped them this time. Wild halibut is so delicious right now it can easily stand on its own. Cover mushrooms with boiling water. Let stand until softened, about 3 minutes. Drain and finely chopped, set aside. Put 1/4 cup of each of the herbs into a food processor; set aside. Stir together remaining 3 tablespoons of each of the herbs, the mushrooms, oil and 1/2 teaspoon salt in a medium bowl; set aside. Bring stock to a boil in a medium pot. 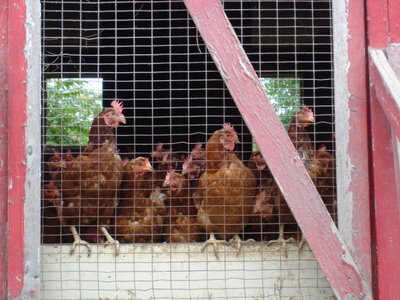 Reduce heat to medium-low; add cockles. Cover; cook until cockles open, about 2 minutes. Discard any that do not open. Using a slotted spoon, transfer cockles to a bowl, and cover (keep heat on). Season both sides of fish with salt and pepper. Add to stock. Cover; cook, carefully turning once, until center is opaque, 2 - 3 minutes per side (may be slightly longer if fillet is very thick). Using a slotted spatula, transfer fish to a plate, and cover. Bring stock to a boil. 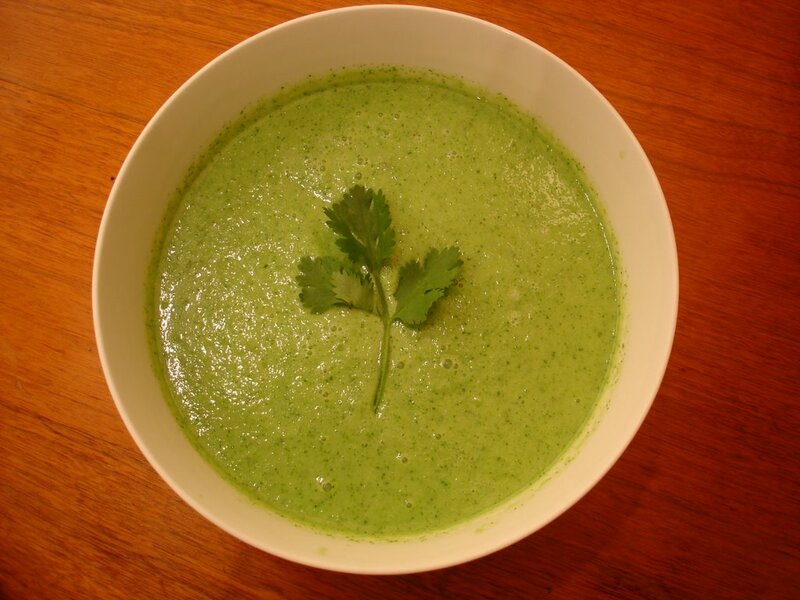 Pour half the stock into food processor with herbs; puree (be careful with hot liquid). Add to remaining stock; pour through a fine sieve into a medium bowl, pressing on herbs; discard herbs (I just pour the food processed mixture back into the original pot with the remaining stock through a sieve - saves a bowl to wash). Divide fish and cockles among bowls. 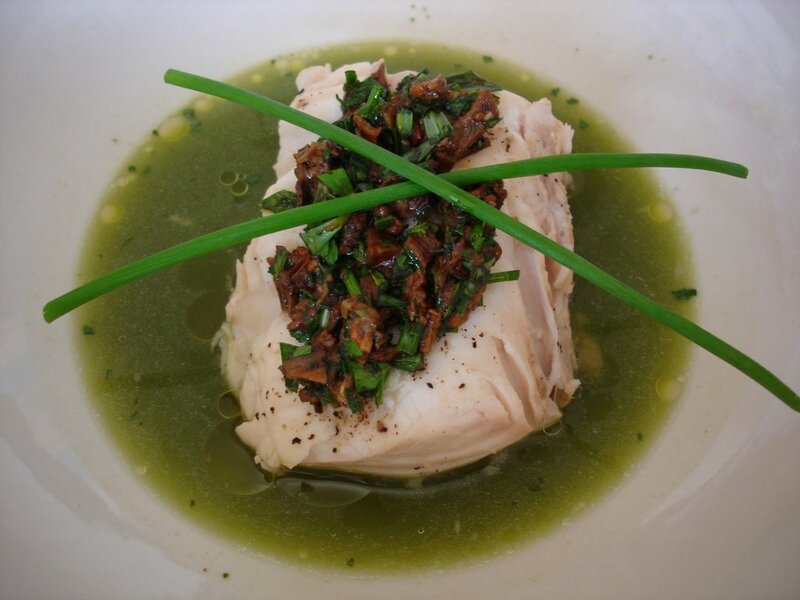 Ladle broth into bowls; top fish with reserved herb mixture. 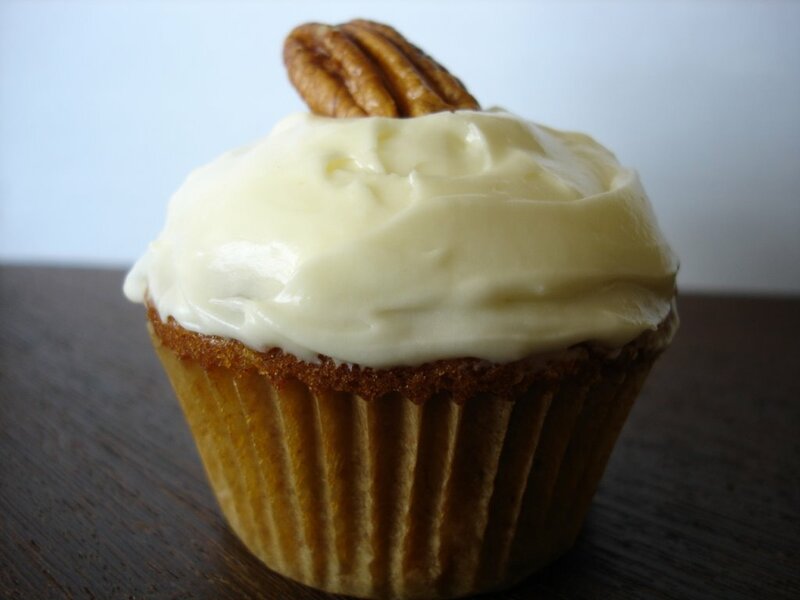 Hummingbird cake is always a non-chocolate favorite. There are many recipes out there that are largely similar except in butter and oil content. Some leave out the coconut. I opted for Martha's because I generally find her recipes to work well. She called for dried pineapple "flowers" as a garnish but they were too fussy for me (although beautiful). Truth be told, I tried to make them and failed - they never dried out enough. See Martha Stewart for details. 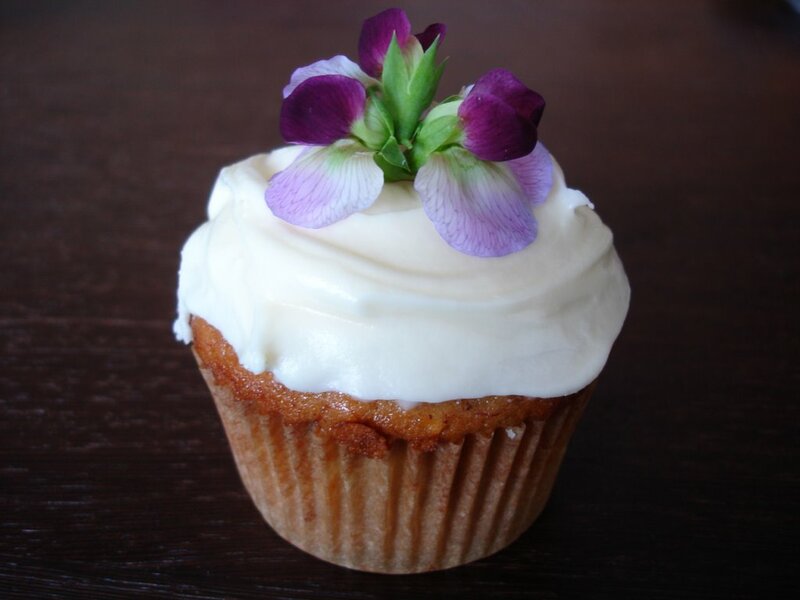 I experimented with a couple of other garnishes instead -- store-bought dried pineapple and pecans to suggest the ingredients in the batter and sweet peas and nasturtiums I found in the farmer's market to remind of hummingbirds (plus, don't they look sweet?). Preheat oven to 350°, with rack in center. Line cupcake pan with paper liners; set aside. In a medium bowl, whisk together flour, baking soda, cinnamon, and salt; set aside. In the bowl of an electric mixer fitted with the paddle attachment, beat butte r, vanilla, and sugar until combined, about 2 minutes. 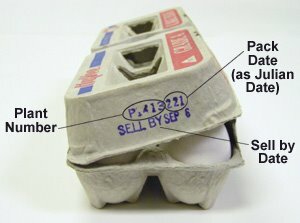 Add eggs one at a time, incorporating each before adding the next. Beat at medium speed until mixture is pale yellow and fluffy, about 3 minutes. In a medium bowl, stir together banana, pineapple, walnuts, and coconut. Add to egg mixture, mixing until combined. Stir in flour mixture. Divide batter evenly among liners, filling about 2/3 full. Bake, rotating pans halfway through, until golden brown and a cake tester inserted in the center comes out clean, 25 to 28 minutes. Transfer to a wire rack to cool completely. Once cupcakes have cooled, use a small offset spatula to frost tops of each cupcake. Decorate with dried pineapple flowers, if desired. Serve at room temperature. In the bowl of an electric mixer fitted with the paddle attachment, beat cream cheese and vanilla until light and creamy, about 2 minutes. With mixer on medium speed, gradually add butter, beating until incorporated. Reduce mixer speed to low. Gradually add sugar, beating until incorporated. Use immediately, or cover and refrigerate up to 3 days. Bring to room temperature before using. I make this when I'm feeling like being really virtuous. It's very healthy and full of flavor. It requires a lot of ingredients but most are pantry items. I have no idea where this recipe came from any more. Preheat oven to 350 degrees. Place all ingredients except lemon juice in a medium size mixing bowl and mix well. Shape into six patties. Place a large ovenproof nonstick skillet over medium heat and when it is hot, add the patties. Cook until deeply browned, about 4 minutes on each side. Transfer skillet to the oven and bake for 8 minutes, or until the patties are thoroughly cooked. Drizzle with the lemon juice and serve immediately. This is an old recipe from a friend (I don't remember where she got it anymore) which makes a healthy, flavorful soup that's good hot or cold (I usually serve it cold). I usually add ~4x the amount of curry powder to pump up the flavor -- season as you like. 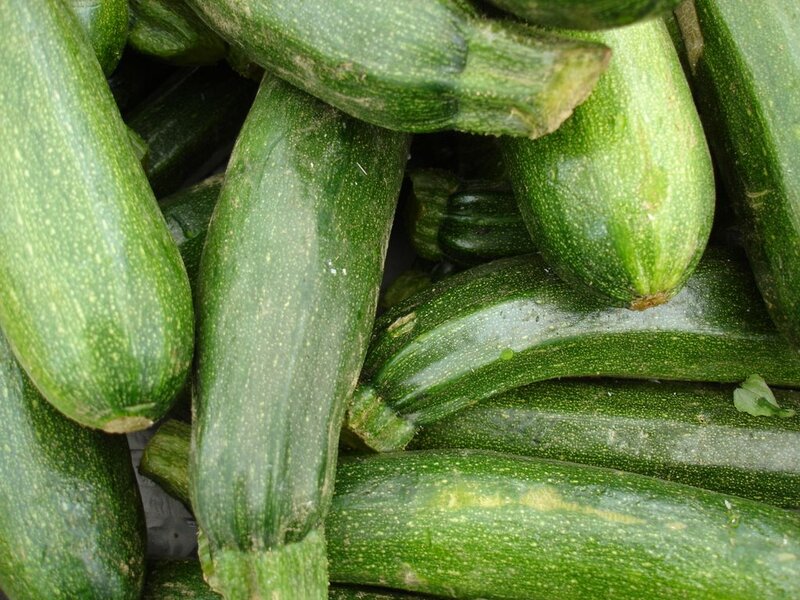 Slice (1/4 inch thick) zucchini and saute in a large, deep pan in hot oil for 2 minutes. Add onion, cover, cook 5 minutes. Add curry, cook 1 minute. Add chicken stock, boil, and cook for 30 minutes after full boil. Puree in blender or food processor being careful not to burn yourself. Garnish and serve.